When he lines up on that line of scrimmage, and digs his hand into the turf, he has one thought on his mind. Protect his quarterback. No matter what. Right before the ball leaves the center’s hands, he eyes the man in front of him. Nothing else matters. It is just him and his defender. Only one man will win. He will do everything in his power to make sure that defender doesn’t get past him. 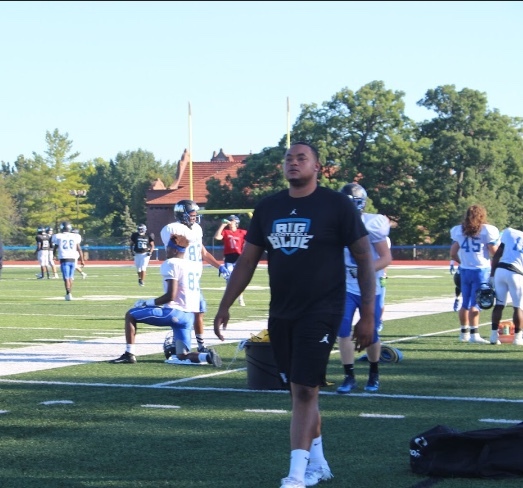 If you would have told Millikin offensive lineman, Kenny Williams back in high school that he would end up playing football in Decatur, Illinois, he wouldn’t believe it. In high school, Williams was devoted to another sport, so football had to take a back burner. Midway through his sophomore season, the 6’6 lineman decided it was time to focus on his one true love. Basketball. Since as long as he can remember, basketball was a part of his life. Basketball is in his blood. His dad, Kenny Williams Sr., played at Purdue University. He was a member of the 1993-1994 team, that advanced to the Elite 8 during the March Madness tournament. While his mom is not a big sports fan, she has loved watching her son play the game of basketball. Williams played both football and baseball as well as basketball in high school, before realizing basketball was his passion. He could have easily decided to play all three sports or focused on one of the other two. He excelled in all three. But deep down, he knew basketball was his way to success. Williams played basketball all four years of high school. He played as a power forward, and a center. He attended Bolingbrook High School, in Bolingbrook, Illinois. While a member of the basketball team, Williams was not just another player on the court. He played a huge role. He was one of the top players on his team and in the state of Illinois. He was the winningest player in school history and named All-State. Some other accolades included MVP, All-Area, and Conference Player of the Year. Along with playing for his high school, Williams was also a member of the Illinois Wolves which is a traveling basketball team. The team is one of the top three AAU organizations in the country. It’s easy to see why Williams decided that basketball was the path for him. College coaches must have taken notice as well. He was heavily recruited out of high school and eventually committed to Northern Michigan University. He played two years before transferring to Jackson State, in Jackson, Mississippi. During his sophomore year at Northern Michigan, tragedy struck. William’s grandmother passed away. He had been close to her his whole life and was raised by her. When he was not at his parent’s house, he was at her house. When she passed, he decided he needed to be closer to his family, who live down south. He needed to go back to where his grandmother was from and where he spent his summers. It was during his first year at Jackson State, where he decided that he had a bigger passion for a sport he formerly played. Football. While Williams had a passion for basketball, he never got over his love for football. It was during the spring season that he went out for the team. He participated in a few practices and played in some spring games. Williams never got the chance to play a regular season game for Jackson State. He left school after his first year and moved back home. He had convinced himself that college was not for him. He began to work three jobs to help support himself. While he was doing well financially, there was still something missing from his life. Football. He was eager to get back out on the field. He had contacted several schools, in hopes that one would reach out to him. Unfortunately, the teams that reached out to him, wanted to see his game tape. But Williams had not played a game of football in a regular season game since sophomore year of high school. He had some workout tape and some footage from spring ball, but that was it. So, schools left him hanging. That was until the Millikin football staff, under head coach Dan Gritti, reached out to him. They did not need to see his tape. They knew exactly what they were getting. A strong, athletic powerhouse that could dominate the line of scrimmage, and that is exactly what they got. Williams transferred to Millikin, before the start of the 2018-2019 school year. Since coming to Millikin and joining the football team, he has been a force to be reckoned with. For not playing football for several years, this guy hasn’t skipped a beat. It is like he never left the game. Granted, he has had a lot to learn. College football is a whole different world than high school. Considering he didn’t play much in high school, he has had some catching up to do. But, he has accepted the challenge and transitioned well. He does what he is told. He is eager to learn. And thus, he is excelling. Williams didn’t play in the first three games, because he was dealing with an injury. He made his first start in week five, against Augustana College. It took him a while to get acclimated. The first couple hits caught him off guard. Guys smaller than him, were driving him off the ball. But after he took a few licks, he got his comeuppance, and started driving them off the ball. And since that game, he hasn’t looked back. He has accepted his new role, and has ran with it. He is no longer that new kid on the block who doesn’t know what he is doing. He has a purpose. He is just like everyone else on the team. He is a Millikin man, through and through. He is apart of a newfound brotherhood. As his first season of Millikin football comes to a close, Williams can’t help but look to the future. He still has a couple years left on the Millikin football team. He is eager to continue on this new and unexpected path. But he is not just about playing for himself. He is now playing for something bigger; his child. Williams had a daughter during fall camp. He can’t help but think about her future and how he is going to support her. While his first goal is to graduate college, his second goal focuses on football. He is hoping to improve his skills, and eventually play professionally. However, if that doesn’t work out, he has a backup plan. He hopes to be a basketball coach. All of his goals, are leading to a bigger outcome. Supporting his daughter. Athletes are asked all the time, “who do you play for?” For Williams, the answer is simple; he plays for his daughter. It’s funny how life has worked out for Williams. He gets out of high school and commits to a college basketball team. And now, only a few years later, he is at a new school, playing a new sport, and is once again committing. But this time, he has committed to being a father to his little girl. Life is full of the unexpected and surprises. But sometimes the unexpected ends up being the perfect fit and those surprises end up being God’s greatest gift. It seems to be that way for Williams.